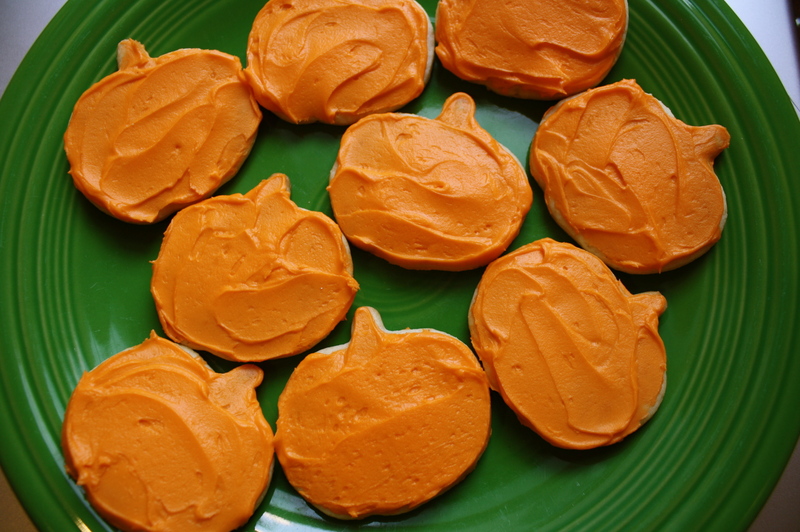 You can’t have Halloween without sugar cookie cut-outs. Actually, you can’t have Christmas or Valentine’s Day without them either, if you ask me. 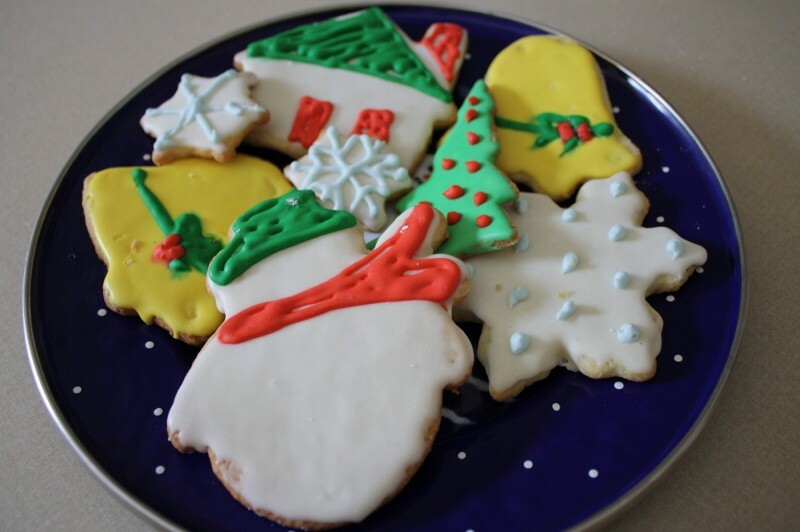 This sugar cookie recipe is my absolute favorite. Aunt Suzy gave it to me when I was 11 years old…it came along with a bunch of other “must have” recipes, a recipe box (that I still use, by the way), a large pot for steaming or cooking pasta (which I also still have, and still use), and “how to cook” tapes made by her. Other than the pasta cooker and the recipe box, this recipe is what I have used the most out of that gift. I love that she was the first person to get me interested in cooking! It was like we were destined to have a blog together someday (although, that word didn’t even exist in 1988). I think this recipe is my favorite because of the addition of sour cream and nutmeg. 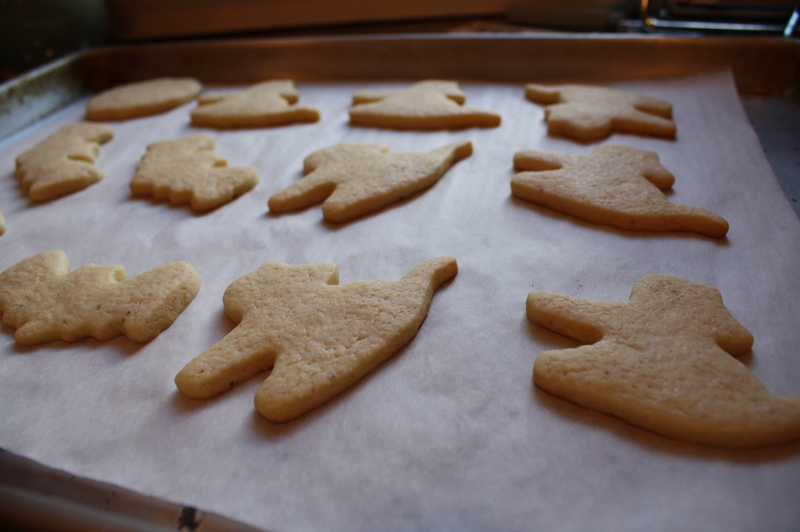 The cookies turn out crisp, but not too crisp, and have great flavor. They’re perfect with vanilla frosting, which is what I prefer to use over royal icing or a powdered sugar and milk glaze-type icing. They may not look as perfect with the frosting over the icing that turns hard and smooth, but they sure taste better! Sift together flour, baking powder, baking soda, salt and nutmeg. Set aside. Cream together butter, sugar, egg and vanilla. Add flour alternately with sour cream. Form dough into ball. Wrap in plastic wrap. Refrigerate at least 6 hours to overnight. Divide dough into 4 parts. Preheat oven at 375 degrees. 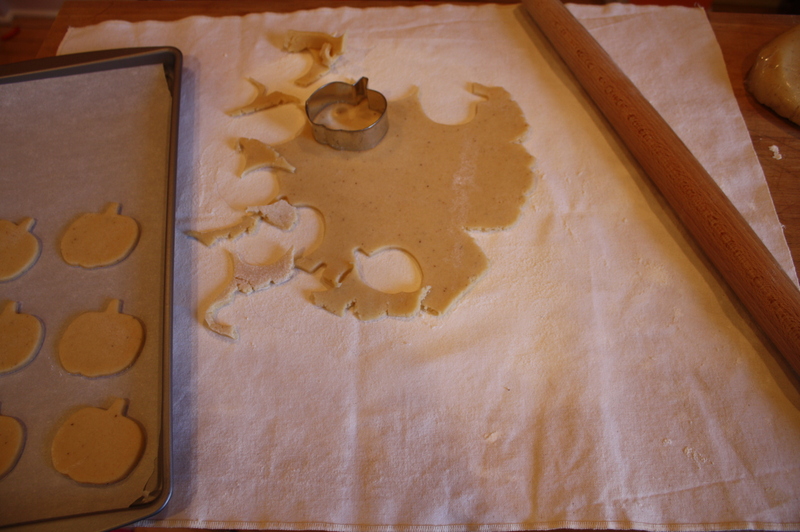 Line cookie sheets with parchment paper, or grease them. Roll out dough to 1/4″ thick. Cut with cookie cutter. Bake plain or with sugar on top (if you’re not icing), 10-12 minutes. Remove from cookie sheets and cool on cooling rack. Frost. 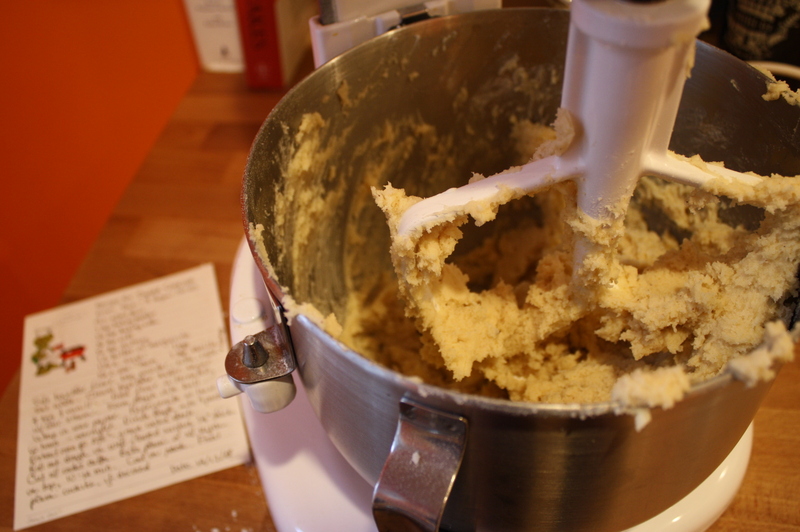 Cream butter in stand mixer with paddle attachment. Add powdered sugar, beat until mixture is starting to clump together in pea-sized clumps. Add vanilla and 2 tbsp milk, beat on high speed until creamy and uniform (scrape down sides of bowl as needed). Add more milk if needed, and food coloring if desired. Frost cookies, let sit for about an hour so that the frosting will set (but it won’t get completely hard because of the butter). If adding sanding sugar or sprinkles, do so right away before the frosting gets a hard crust on top. As Granny would say . . . “what’s not to like with 1/2 cup sour cream?” Next time I’m down, you’ll have to show me the recipes I gave you! I’m remembering some, but not all. These are so cute. I love decorating cookies!